Crisp, flaky flatbread, encasing salty, savoury, spicy flavours a la Mexico and gooey melted cheese. Crunchy tacos filled with soft, mellow, salty crab, spicy, savoury accompaniments, refreshing lettuce and soothing, creamy avocado. Burnished, squidgy sweet potatoes with charred edges and tangy, caramelised lime. Try any mouthwatering dish on it's own or cook up the lot for a delicious Mexican feast. Preheat your oven to 190C. Peel and cut your sweet potato into fat cubes and pop into an oven dish. Drizzle on some olive oil, the chipotle chilli sauce, salt and pepper. Nestle in your lime halves, mix well and slideeee into the oven. Give them a check after around 20 minutes and turn if necessary. Take out when they're tender, squidgy, sticky and burnished and garnish with torn parsley. Any juice left in the caramelised limes, squeeze over the potatoes, delish! This is really just an assembly job, so incredibly simple. If your shells need toasting up, do so. Then fill with a layer of your shredded lettuce. Mix up the crab meat, which you can get at your fishmongers all clean and picked for you, with the mayo and chilli sauce. Season, then spoon a layer of this mixture on top of the lettuce. Next, lay on your avocado, fresh chives, chilli and chive flowers if you can get them! I like to roll up and concertina some foil to act like a little stand. Perfect, crispy, flavourful little boats of delight. Par boil your diced potatoes in salted water and chop up the pepper, onion, chicken, chorizo and chilli. Get your chorizo into a pan over a med-high heat to extract it's oily, paprika-y goodness. Then add your onion, pepper and chilli. Stir and cook for 10 minutes until the veggies get tender with scorched edges. Once your potatoes are tender, add them along with the chicken and chipotle sauce to the pan. Cook for a couple of minutes until all the flavours meld together. Taste for seasoning then decant into a bowl. Spoon the mixture onto 1 half of your flatbread, top with grated cheese, fold in half. Repeat until you run out of mixture/flatbreads. Pop your half moons back into the pan, turning when they're crisp and golden on one side. Repeat for all the wraps before hacking into halves with a sharp knife. Serve haaaat. Take the whole lot to the table and get everyone to tuck in and help themselves, a great one for a chilled night in with friends. Why not try adding some Mexicana-style tequila cocktails into the mix! My mouth is really watering now...those tacos look amazing! 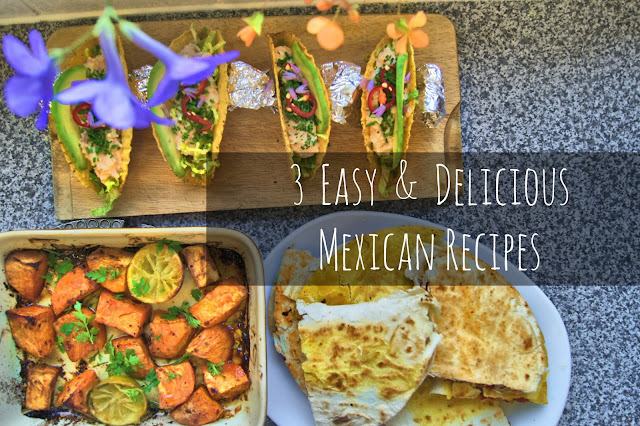 Those quesadillas look incredible, although I would eat all three of these happily. I don't think I realised until now how much I enjoy mexican food!